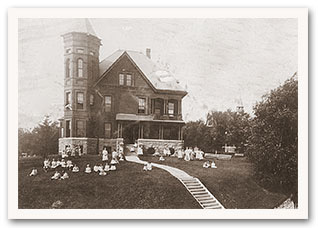 The Minnesota State Public School for Dependent and Neglected Children was created by the effort of the 1885 State Legislature, Governor Lucius Hubbard and Reverend Hastings Hart. Before this facility was created, orphaned, dependent, abused, and neglected children were placed in country-poor farms with adult derelicts, petty criminals, alcoholics, and the mentally ill. This school was created to be a haven where these children could be saved and transformed into productive members of society. The cottage plan was created as an alternative to the linear plan. The cottage plan was to afford the children a family-like group and atmosphere. There were 16 cottages on the grounds that housed up to 500 children at any time. Children were constantly being placed out and new and unfamiliar children being placed in. These were orphaned, dependent, neglected and abused Minnesota children who had been made Wards of the State by the probate courts. The State School was to be a temporary home, preparing the orphans for adoption or placement in new, "good homes." While the intent was to keep the children only for a few months, some stayed on for years and became institutionalized. Galen Merrill, Superintendent from 1886 until his death in 1934, played a central role in the national discussion on child welfare. His pioneering efforts played a pivotal role in the development of Minnesota Child Welfare Laws enacted in the Progressive Era. By 1945, the state legislature, on the advice of childcare workers, phased out the orphanage and the institution took on a new role of providing academic and vocational training for Minnesota's mentally challenged children. That era ended in 1970 and the State School was permanently closed. In 1974, the City of Owatonna purchased the campus to house city and administration offices.